If you’re looking for a new source of income, you may have considered the idea of buying a vending machine franchise. On the surface of it, this type of money spinner looks pretty solid as a fresh direction to branch out in. It’s a flexible way to work, you can keep the enterprise small or grow an empire, you’re your own boss, the initial investment is modest and your success will depend on commitment and drive rather than experience. And the system also allows you to develop business experience in spades. So far so good. But what about that all important question? Do vending machines make money? Can you make money with vending machines? The short answer here is: “Yes”. Many new franchisees make a profit from vending machines. The longer answer is: “Yes, but…”. That’s because, although vending machine profits are typically dependable, the success of an enterprise like this will vary according to the commitment of the franchisee. Ticking all of these boxes will help ensure that your vending franchise makes money and that you see a return from your investment. 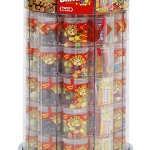 Many vending machines will generate a passive income with less input, but the most successful machines will be operated by engaged, organised and proactive franchisees who really stay on top of their small business. How can you find the best sites? At Tubz we have a dedicated site finding department with over 12 full time, qualified staff who call upon their vast experience in finding suitable sites from our huge database and list of professional contacts. These are all handpicked for that particular new franchisee. This gets your new business off to a flying start and ensures you start earning cash from day one. How much money can vending machine franchises make? Now we’ve established that vending machines do indeed make money, it’s time to discuss how much money franchises like this can make. To do so, we’ve turned to our business bundle page to help us demonstrate the potential returns of a vending franchise. Please note that these profits are specific to Tubz Vending towers. Here are our projected annual turnovers and gross profits based on 10-100 machines selling 10-30 Tubz per week. Even with just 10 weekly sales (just over 1 sale per day) from 10 machines, annual profit can be an impressive £2,340. At the other end of the spectrum, extremely active franchisees with 100 machines selling 30 Tubz per week could see profits of £72,200 per annum. Are vending machines a profitable option for you? Would you like to find out more about how our franchise works? We’re here to help. Get in touch today via info@tubzbrands.co.uk or call us directly on 0845 601 900.